How do you hold up the roof? People building houses or any other kind of people have always had this one big problem, which you may have had also if you ever tried to build a clubhouse: how do you get the roof to stay up? How do you build the part of the wall over the door or the window? One way (the way people figured out first) is to have a long piece of wood or stone that goes over the whole way from one wall to the other, like the picture here. That works (though it’s harder than it looks to get the walls to stay up with the roof on.) And many people did build their houses and tombs and temples that way in the Stone Age and the Bronze Age. But if you want to make a big building, you need very long beams to make a flat roof like this. And there are not very many big trees in the Mediterranean, so it is very hard to get so many long beams. One thing that helps is to make slanted roofs (gabled roofs), which is what most Greek temples have. But you still need a lot of expensive long beams. The arch is another way to solve this problem. It’s a way of making a roof or a doorway or a window without using any beams at all: just a lot of small stones, or small blocks of wood, or clay bricks. That’s a lot cheaper and easier to get than the big beams. You use the weight of the blocks to hold the arch together. People have used arches since the Bronze Age in tombs and sewers, but Roman architects were the first to use arches a lot in their public buildings. 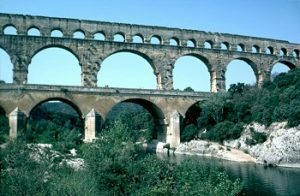 Arches are important in Roman aqueducts, Roman basilicas, and Roman amphitheaters, for example. 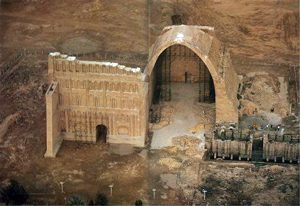 Not much later, Parthian architects in Iraq and Iran started to use a lot of arches in their buildings too. Sassanian architects also used a lot of arches. 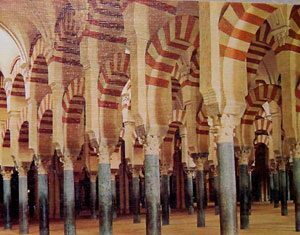 Later buildings in the Islamic Empire and in medieval Europe, like mosques and palaces and cathedrals, also used a lot of arches. You can try this yourself if you get a set of arch-building blocks. Or cut them yourself out of wood. Try it with Legos. You lay the arch out on a board laid flat on the floor, and then tilt it up slowly and see if it holds. Arches to Zigzags: An Architecture ABC, by Michael J. Crosbie (2000). Shows what an arch is, or a gable, or an eave. Eyewitness: Building, by Philip Wilkinson, Dave King, and Geoff Dann (2000). Lavishly illustrated, like other Eyewitness books, and with good explanations of most architectural terms. City: A Story of Roman Planning and Construction, by David Macaulay (1983). Cite this page: Carr, K.E. What is an arch? History of Architecture. Quatr.us Study Guides, May 24, 2017. Web. April 21, 2019.